WRC should NEVER turn down an invitation to a party! I am thinking we gather at American Tap Room (map) afterwards? Should be fun for all! 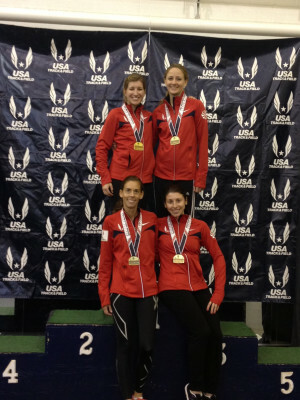 Last weekend, WRC member Laura Jennings raced to 1st place in both the women’s 30-35 3000 Meter race and the women’s 30-39 non-club 4 x 800 Meter race at the 2013 Masters Indoor Track & Field Championships. The Championships took place in Landover, MD. We’d like to extend heartfelt congratulations to our friends over at Potomac Valley Track Club, for their team title at last weekend’s USA National Masters Track Championships at the Prince George’s Sports and Learning Complex in Landover, MD. Well done, one and all, and encore! Stay tuned for stories from within WRC’s ranks; Laura Jennings and Alan Pemberton were both racing on relays at these championships. Google responded that 26.2 km is roughly 16.2799 miles. For those interested in covering this distance during this Sunday’s Distance Run (SDR), I propose Rock Creek Trail with a modified version of the Western Ridge-Valley Trail Loop. The modification to the posted route will be turning onto Wise Road (from Western Ridge Trail to Valley Trail) rather than continuing up to Beach Drive. Assuming a fully charged battery, we will have a better map for this run after Sunday. Yes, all 30 foot high geysers will be avoided! I would like to propose that WRC provide Arlington Safety and Health Foundation (Jay Wind‘s non-profit) race assistance on Sunday, 24 March, at the W&OD 5K. The race starts at 4pm and doesn’t conflict with Sunday morning. The registration starts at 2:30pm and I’m sure [Jay] can use a person or two there. There’s also a need for course sentries in several locations. Since it’s a double out and back 5K on the bike-path, nobody will out there that long. Probably absolute maximum time commitment would be between 2:30 and 5:30 (and that’s helping to clean up). I’ll probably be running the race and probably helping with the packet pickup; last year I helped registration too, and I’ve helped at the finish line in the past as well. So, if we can get four or five WRC people helping, that would be great. The starting point is practically next door to John Kendra, too, right in the middle of Falls Church. Friends of the W&OD are a beneficiary, and the local Boy Scout troop usually provides volunteers. If you would like to lend a hand on this coming Sunday, March 24th, please contact James at either treasurer@washrun.org or jbs1958 [at] comcast [dot] net. He will make sure that your talents are used either on the course or to help with other parts of the race. And for those who are interested in racing, you can enter either online or by USPS mail. It’s officially spring and our highly accurate weather forecasters are predicting chilly temperatures. Regardless, spring racing season is heating up and it’s a perfect time to gather to discuss Grand Prix strategy at Capitol City Brewing Company (1100 New York Avenue NW, D.C. 20005) from 6 – 8 p.m. I’ll see you there!